It's hot in South Georgia in late May. Hot and muggy. Everybody with any good sense heads to the beach or the lake or the river or the pool or the pond or the backyard sprinkler as often as possible this time of year. Because while we may not *technically* be living in a swamp, we are most certainly swamp-adjacent. It's not the heat, you see… it's the humidity. No point sweating, because the very air is so saturated, it has no need to wick away any moisture your skin might try to produce to cool your body off. This kind of weather calls for a different pace of life. Long, lazy summer days are a way of life down here. Shady porch-swing sittin' really is a thing, and it's easy to find whole neighborhoods gathered at the house that has the pool in the backyard. With a long, hot Summer bearing down on us, we are looking to the bayou and beyond for great new hot-weather tastes. Our favorite creation so far has been our fun play on gator nuggets that you may have experienced at any number of redneck carnivals growing up. But instead of the shoe leather, over-fried gator nuggets you may have tried before, we've experimented and found ways to elevate the humble Gator Nugget! We start with wild-caught Louisiana gator, which lends a much more meaty taste than your typical farm-raised "tastes just like chicken" alligator. Tenderized & brined to bring out the tender possibilities of the meat, we then carve the gator meat into nice bite-sized chunks, and dredge them in our tasty, simple breading. A quick toss in the fryer, and they are ready to join our bayou remoulade & local cabbage slaw. Gen ou ale! Yon plat été bon gou! … We're musing over the idea of a gator po boy next time we get our hands on some good gator… Hrmmm…. On this day, we remember. It's a quiet day in Downtown Moultrie. The flags are flying at half-mast, a few are kids playing on the courthouse lawn. Most of our fellow businesses are closed, so parking spaces are vacant on every block. The stray cars that drive by seem to be in no hurry. Even the wind is calm… just a gentle breeze blowing the flags and the trees and the handful of white clouds from time to time. This peaceful, beautiful day in our pretty little town was made possible, in part, by the sacrifices of generations of brave men & women who selflessly gave their lives so that we can enjoy all that we so easily take for granted. We are a uniquely blessed nation, our citizens imbued with a freedom rare within the history of all humankind. Today is a day to remember that all of the privilege and peace we were blessed to be born with was not earned without incredible sacrifice. June's gonna get kicked off right at The Square! On June 1st, at 7:30, we're celebrating Summertime with a special Summery Wine Night! All the wines will be bright and crisp, and the food pairings will be all-out devoted to the Summer flavors that we wait for year-round. Instead of one country, this wine night will have us chasing the sun around the globe, making stops in the South of France, Northern Italy, over to the hot sand shores of Portugal, and then back home to sun-kissed California. Seats will be limited, please let us know ASAP whether you would like for us to reserve a table for you and your summer-loving friends! You can reserve in person next time you dine with us, by calling 229.985.2525, or by emailing info@thesquaremoultrie.com! But then, we discovered a magical secret talent: that owner Phillip Viohl has a natural knack for making incredibly silky smooth, velvety thick crème brûlées! The truth is that crème brûlée are a simple, classic dessert, naturally gluten-free with only 3-5 ingredients. They just take a LOT of patience, constant diligence, and that "sixth sense" that tells him when they are perfectly done. And Phil's got it. After they are blended, baked, carefully chilled, and set up, then the real fun begins! Crème brûlée literally means "burnt cream," so we actually bring the fire show to the table, firing the crème brûlées table-side, filling the dining room with the fantastic scent of caramelizing raw sugar! Wait a few seconds for the sugar to turn to a lacie It's a fun way to end a supper, and it's a dessert that is big enough to share with the table as well. Almost every time we feature crème brûlée, someone tells us that they are the best they have ever had. Folks often comment on our unusual crème brûlée cups. Carrie's Mom and Dad are true American Pickers, traveling the country constantly looking for treasures. When they found a huge lot of vintage Fire King mugs, we knew that we our perfect containers for crème brûlée deliciousness. (Thanks, ya'll!) Tried and true, the mugs stand up beautifully to the heat of the oven, and to the fire applied to the custard seconds before serving. Tonight, Phillip is making most crowd-pleasing Crème brûlée recipe, his Fresh Brewed Espresso Vanilla Crème Brûlée. Ya'll come on in and share one with some folks you like a lot! Know what gifts Moms really love? Kisses, little smudged paintings, lazy day snuggles, phone calls, uncontrollable giggles, fingerprints on windows, sitting in sunny stands watching their little athletes working hard, throwing flowers on stage for their budding thespians, taking too many photographs on vacations, outstretched arms from toddlers, sleepy smiles from newborns, great big hugs from great, big kids, happy tears when they watch their baby graduating, mother-son dances, kissing boo-boos, tying ribbons on tiny ponytails, kissing sleeping kids in the middle of the night, and hearing "I love you, Mom." Yeah, being a Mom is it's own reward. But we'd love to help you celebrate the great Moms in your life. This weekend, pick up a gift certificate, a good Square meal to-go, or bring the loveliest ladies in your life on in to the restaurant for a great meal… and be sure to tell her that we'll handle the dishes! This week's Wine Night was a fun exploration of Italian flavors and culture, which turns out to be not to terribly dissimilar to Southern cuisine! We kicked off the night with a classic Caprese Salad, using local cherry tomatoes & basil with imported baby mozzarella. The first time Phillip & I experienced a Caprese salad was in a little out-of-the-way Italian restaurant in Germany of all places. What a fresh, bright combination of tastes! We paired the clean flavors of the caprese with a Fruili region Pinot Grigio by Jermann. Our diners found the Pinot to be easy-drinking with a velvet fruitiness, and a smooth, bright finish. The next course had an exotic name, but anyone who has ever had cheese grits & shrimp here in the South will find very familiar flavors in our Asiago Polenta with Seared Sea Scallops! Polenta is basically a yellow corn version of grits, the ubiquitous starch of the south. For Southerners, this is a very approachable entree, and we've found that Polenta is as versatile as Grits, showing up in everything from a sweet porridge for breakfast to naturally gluten-free polenta "fries." 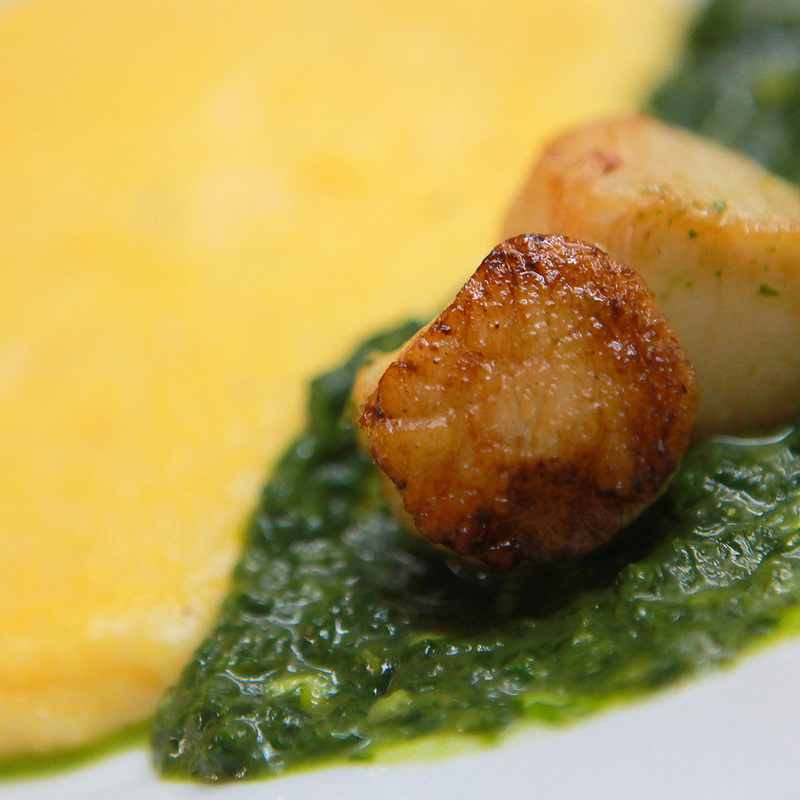 For our wine night, we served a very simple creamy, cheesy polenta as a base for these pretty seared sea scallops, and the peppery arugula pesto that Jessica whipped up right as we were plating this dish. We paired this with another Veneto region wine, this time the Soave by Pieropan. Our diners really liked the clean, bright, and fruity flavors & balanced acidity. Wine nights are always our favorite nights of the month! It's a time for our kitchen to stretch their skills & creativity, and also to explore different cultures and techniques. For the nerdy, foodie cooks that we have here, that's a special treat! If you want to be included on the next one, be sure to join our mailing list! <--- Right here! Staying with classic tomato flavors for the next course, we moved to a very traditional tomato-basil risotto with grilled Italian sausage. This course is the closest we came to the "spaghetti & meatballs" flavors that many Americans assign to Italian dining. (Not that there's anything wrong with that!) This course came with what turned out to be the favorite wine of the night, Candoni's Elviana Red Wine from the Veneto region. It probably helps that beautiful wine maven, Elviana herself, graces the bottle in a fantastic graphic design moment. Our diners found this wine to be exceedingly tasty, with big round flavors, and enough body (ahem) to work with the bold flavors of the fresh tomato risotto & sausage. Our final course was a special recommendation from one of our Wine Night regulars, who said that a good Tiramisu is one of her favorite flavors in the world! So, Jess got to work, hand-whipping up some mascarpone, and baking up her own version of Square ladyfingers! The results were truly some of the prettiest little desserts we've ever had in this building! We wanted to find a great, elegant chianti to pair with these beauties. After trying several other chiantis, we didn't find anything we liked better than our house chianti, Chianti Classico by Castello di Querceto. We found this bottle to be soft & delicate with nice subtle coffee flavors that teamed up beautifully with our house made tiramisu squares! For many, owning a restaurant is a dream job. Cooking fantastic food for your community, mixing beautiful drinks, working in a high-energy setting, tasting wine & food all day... sounds awesome! And owning a restaurant really IS awesome... but like any business, the inside view is very different from what it may seem from an outsider's point-of-view. As a diner, it might seem nearly effortless to run a restaurant. However, if you have ever had a great experience in any restaurant, rest assured that a LOT was going on behind the scenes to ensure that you could relax & enjoy your meal! 1.) The restaurant becomes your family's living space. Our kids do their homework here. Almost all of our meals are eaten here. We don't have cable at home, because nobody is ever there to watch TV. Our family members regularly get put to work if they are standing still long enough. Wanna hang out with us? Please come see us here, because we don't have many "normal" times off. The upside is that we get to see many of the people we love here all the time. The downside is that without a lot of prior planning, we are unable to have much of a social life outside of these walls. 2.) Your staff becomes your extended family members. We work with most of our coworkers into the wee hours of the morning. We stress together, celebrate great nights together, commiserate over abusive tables together, laugh together, have ridiculous in-jokes together, share the same friend groups, travel together, party together, grow together, learn together. We are very, very picky about who we hire, because one bad apple can make everybody's job and life harder. We are always seeking out great, motivated, and friendly folks with true servant hearts, and a real passion to take care of guests and each other. 3.) THE WEEDS can be as terrifying as they are exhilarating. Every restaurant has that moment... the kitchen is cruising along at a nice pace, all is going well, everyone is happy. Then suddenly, the tickets are printing off the printer so fast we cannot even grab them before the next one pops up. Every eye on the gas stove is occupied, every inch of the flat top is filled, the salad guy is making salads as fast as his hands can go and it's still not fast enough. We're in the weeds. The weeds are a restaurant's proving grounds. We never want a table waiting for their food, we always want everything coming out perfectly, so the weeds throw everyone into overdrive, from dishwashers to cooks to wait staff. On a good night, the weeds provide a surge of adrenaline and a new sense of teamwork. On a bad night, the weeds leave everybody in the kitchen feeling beat up and the waitresses feeling hung out to dry. Of course, we only want those "good night weeds," so we constantly train and reevaluate our methods to be as efficient and nimble as possible. 4.) Your regulars become your community. We know about break-ups and make-ups and kids graduating high school and babies being born and folks losing jobs and/or getting raises. We know who likes their served tea half-n-half, who should really only have one glass of wine, who likes their "i" scratched off their beer bottles, who likes their burgers without buns, who wants extra crackers, and who always wants to try the feature, because they like something new all the time. We laugh with them, we mourn their losses, we cheer their accomplishments. We LOVE our regulars, because they have become more than just guests, they are friends now. They are our support system, and seeing them walk in the door makes our jobs happier. Some of our "regulars" actually live hours away, and we only get to see them a few times per year, while many of our regulars see us a few times a week. Regardless, they are one of the best parts of our day. 5.) Hand-washing is a constant habit. Anybody who handles food and drinks should wash their hands often; but for restaurant folks, hand-washing becomes a compulsion. Pick up a dirty dish from a table? Wash your hands before & after. Carving a steak? Wash your hands before & after. Taking a dish to a table? Wash your hands before & after. Making a salad? Wear gloves and still wash your hands before & after. We go through an insane amount of hand soap and paper napkins keeping our hands clean. And moisturizing lotion at the end of the day is not an optional luxury... all that washing can really dry out a restaurant worker's hands! 6.) Eating a full meal is a rare treat. 7.) Our delivery drivers are our heroes. If we could through a party every time one of our fantastic delivery driver showed up, we would. Last week at The Square, we had a delivery driver drive three hours on his weekend off to deliver two boxes of wine that accidentally didn't make it onto his truck earlier in the week. That might sound incredible, but we have found that delivery drivers are some of the hardest working, most caring and helpful members of this industry. Drivers work hard, long hours, frequently lifting heavy boxes, performing the parking equivalent of a contortionist, and delivering to a variety of non-ideal locations. 8.) Tips matter, reviews matter. If you have never worked in a sit-down restaurant setting, you might not give tipping much of a second thought. Who cares whether you leave a 14% tip or a 24% tip? It might only be a few dollars difference, after all. Aside from the fact that servers depend on tipping for their livelihoods, most waiters and bartenders are people pleasers. Tipping is the most clear way to tell them that they did a great job. Every restaurant manager or owner has seen a waiter do a fantastic job for a table, only to be emotionally deflated by an insultingly low or zero tip. Waiters all look to their tip percentages at the end of the night as feedback for whether they are doing good work. Fun fact: Adding a heads-up penny on the table to your tip is a traditional way of telling your server they did an exemplary job! Along the same lines, restaurant owners & managers live and die by reviews. Whether it's an in-person conversation or a Trip Advisor, Yelp, Urbanspoon, or Google review, guests' opinions help restauranteurs steer the ship of our businesses. A negative review can keep a manager up at night, while a glowing review can have the whole staff floating on air. 9.) Long days & late nights are our normal days & nights. The restaurant industry is different from almost any other industry. Any good restaurant spends a large number of hours before we open each day preparing fresh food from scratch. We work exhaustive, late hours, cleaning and re-setting long after the last table has paid their bills and left. Often, we gather at the bar or out back at the end of the night to go over how the evening went, catch up with each other, and unwind before heading home. Here at The Square, the first person arrives at around 8am, and the last person usually cuts the lights off between 1am-3am. Decision making becomes a balancing act between instinct, experience, calculation, and training. The choices never end, because our continual goal is to provide the very best experience possible to our guests. In the end, restauranteurs choose this path because we love it. Next time you go out to eat, look around and see if you can some of the gears grinding all around you to keep the place ticking long. Owning a restaurant is a constant challenge; but we wouldn't exchange it for any other career in the world! The Square's has a secret bar… did you know? Perhaps the very best-kept secret in Moultrie, Ga is The Square Restaurant's hidden bar! Tucked behind the big yellow wall in the middle of the restaurant, people will often visit the restaurant several times before they ever discover that we have a bar in the building at all. For families, this allows family-friendly dining without the feeling that you're having supper in a bar. For those who would like to have a beverage or a meal in a more cozy setting, the bar & lounge area offers a secluded little hideout away from the dining room. Many of our regulars head straight back to the lounge to claim their favorite bar chair, couch, or pub table. With ample space in the bar, we are able to offer a fantastic wine & craft beer program, as well as an extensive spirits menu. We put a lot of time & care into selecting the most interesting & delicious wines & beers that we can find. Our wine list is continually evolving, growing with our menu, and deepening to suit our diners' tastes. From the richest red wines to the lightest sweet white wines, we have a wine for every palate. We carry as many locally developed Georgia beers & brews as possible, currently featuring Eventide & Terrapin on draft, and Wild Heaven & Red Brick in bottles. As the Georgia craft beer movement grows, we'll keep growing our list to reflect the ever-expanding options available locally. Click this link or the full wine & beer list! Phillip upholstering the seat cushions. Just about the only choice he didn't make was the fabric… he left that to the ladies. When you have a restaurant, there are a million things to consider. What sort of tea glasses should we have? What should the menu look like? What color should we paint the walls?What kind of music should we play? How heavy should the plates be? What types of crackers should we buy? What kind of chairs should we use? What should the restrooms' air freshener's scent be? Which forks have the right weight? What should the thermostat be set at? All of these questions are asking the same thing, really: How can we provide the most comfortable, relaxing, enjoyable dining experience possible for our guests? For months now, The Square has been undergoing little tweaks & changes... New chairs, improvements to our menu, the addition of a kids menu, continually training our staff, broadening our beer and wine selection. More recently, we added window blinds to control the amount of light coming in during the bright hours of the day, and switched out the table legs for more comfortable & spacious legroom under our tables. All of these were met with positive responses from our diners. Still, Phillip thought that there was one big improvement needed to be made. He wanted booths. In our building, adding booths is easier said than done. 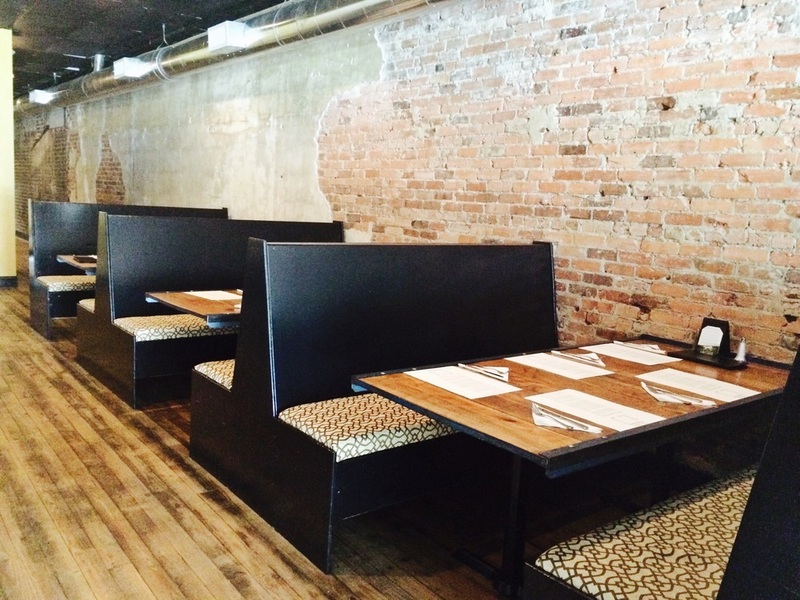 We did not want to have to compromise our antique cotton-cart tables because we love them, and our diners love them. But, these tables don't fit any standard booth size. They are big and heavy and made from beautiful old hardwoods. So Phillip got out his trusty graphing paper & pencils and started drawing. 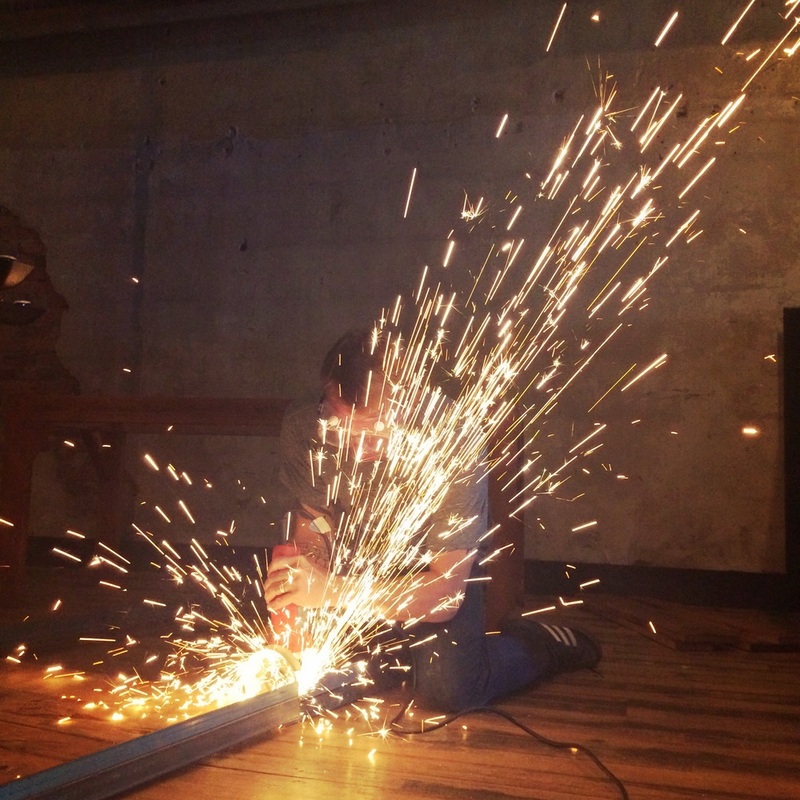 Within an afternoon, he had designed and measured out the plans to hand-build booths to fit perfectly within our space, and to work with our tables. And then the work began. 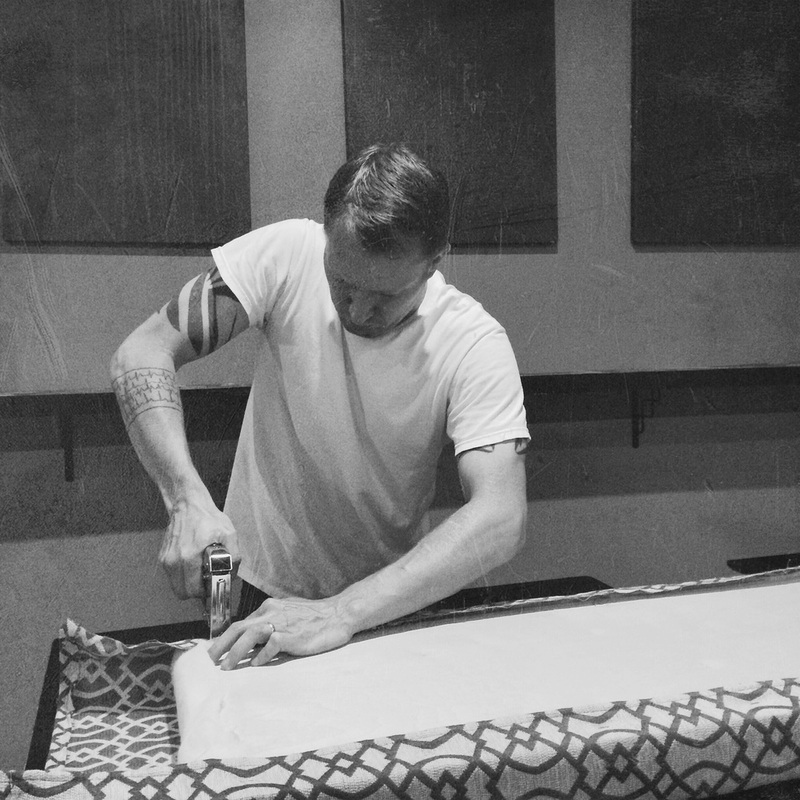 In between his already insane schedule of managing the business of the restaurant & leading In the kitchen, he found time to get to his workshop & build the booths by hand. Countless trips to the hardware store & the lumber yard, many late nights after the restaurant closed, and Sunday afternoon days later, he finished them. Thank goodness for our herculean coworker, Jason, because he showed up on Monday to help Phillip move & install these hefty booths. ...Judging by the overwhelming response on Facebook, other folks appreciate his hard work, too! Continually changing to fit our diner's needs has been one of the easiest choices we've made as a restaurant. We'd love to have you in our place here in downtown Moultrie, Ga anytime you're looking to be spoiled with a delicious meal! So much to do at the Spring Fling & Backyard BBQ Festival! Downtown Moultrie is not just a pretty city center; it really is the vibrant heart of our town. We have lots of fantastic businesses and restaurants, a lively community feeling, and lots of great opportunities to get outdoors and enjoy fantastic downtown events all year 'round. In the Spring, our central downtown event is the annual Spring Fling & Backyard BBQ Festival! The Downtown BEACH. You read right… the downtown section of South Main will be transformed into a sandy beach this weekend! Be sure to be there at 12:15 on Saturday for a beach party! Complete with beach music, dancing, beach balls, and more. Delicious foods downtown! When you're feeling hungry, you don't have to look far for great food options! For the first time, The Square Restaurant will be offering handy to-go portions of many of our picnic favorites, like our smoky pimento cheese, boiled peanut hummus, chicken salad, salads-to-go, fruit cups, and more! Just look for the tent in front of our building! Of course, no Spring Fling would be complete without some Frozen Yogurt from Family Ties. Also, look for the food trucks for traditional carnival foods! The Amphitheater Stage ALL day. Find a comfortable seat at the amphitheater and settle in for a lot of great entertainment starting at 9:00am. Lots of live music, dancing, awards, and more! <--- Follow this link for the schedule of events. -Sea Mobile, an interactive marine exhibit including 5 touch tanks with beautiful sea life from the Gulf of Mexico, 7 aquariums, and even microscopes so that little scientists can discover the tiniest marine creatures! -FREE kids' crafts by Moultrie Service League, Moultrie Junior Women's club & Lowes. -YMCA Healthy Kids Day activities, encouraging kids to get active and have fun. -Train rides, rock wall climbing, jumpy houses, stilt walkers, and much more! Downtown Farmer's Market. This is farm country, after all! Bring your shopping basket and enjoy browsing through fresh, local produce, food crafts, and gifts. TASTE the BBQ competition. Every year, Spring Fling attendees get to smell that amazing BBQ cooking, but never got to taste… until this year! This year, for just $5, anyone can sample and vote for their favorite BBQ over in the Civitan Club's BBQ Taster's Choice Tent. Explore the Arts. Don't miss the Arts Center's fascinating art demonstrations, glass blowing, and an art school juried art competition. MUSIC! Moultrie is one musical city, and this year's South Main Street Stage will keep music lovers dancing and singing along all day, starting at 8:45am. Look for the Beans & Strings Students, Elle Perryman, PB & Jam, Waylon & Ryan, the 1st Methodist Band, Daniel Parrish, and then the outdoor concerts culminate with a performance with the incredible Maggie Koerner at 2:30. Don't miss Maggie, she's coming here all the way from New Orleans! But the music doesn't stop in the afternoon! At 8:30PM, Maggie will give an encore acoustic performance inside of The Square Restaurant, and Naturally Southern will be playing inside of T.Halls starting at 9:00. Great downtown deals. This year, don't forget to explore the great shopping in Downtown Moultrie. Many of our downtown stores will be open, and offering fantastic deals, so come on in! We love Salmon. Fresh, sweet, tender, and packed full of health benefits, our sustainably harvested salmon is one of our most popular dishes by far, and for good reasons! 1.) This fish is FRESH! We buy our fish whole, and as fresh as possible. In fact, they ship to us unfrozen. These are no pre-packaged frozen filets. Phillip breaks each fish down carefully by hand, so he can ensure the quality of every portion. 2.) Our salmon are ocean-grown in a pollutant-free area, free of industrial waste & toxins. We feel good about our Salmon because we know that these fish are a safe, healthy, and environmentally responsible option. 3.) Our Coconut Jasmine Rice. 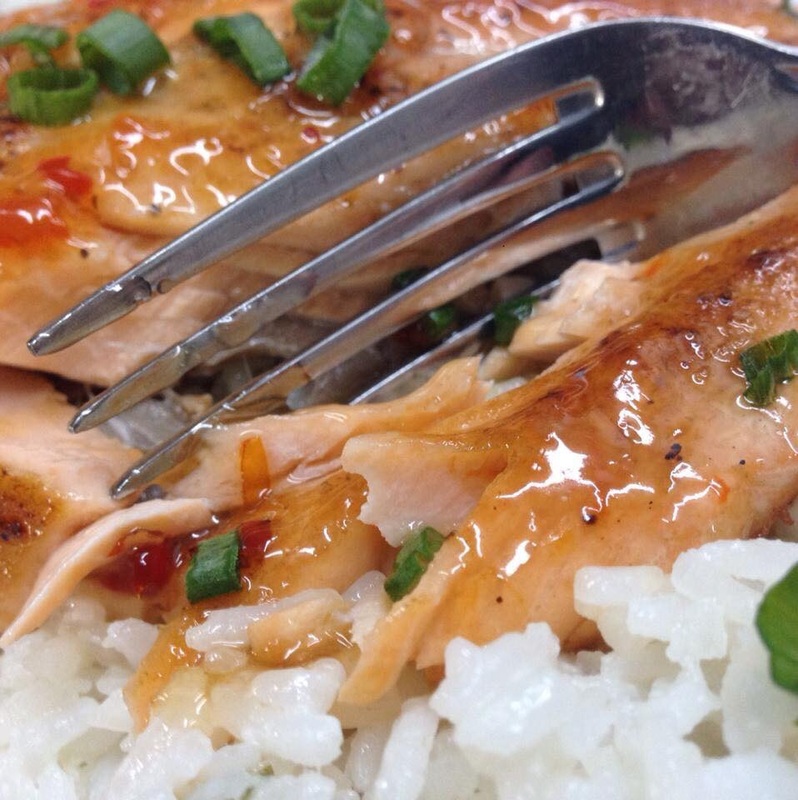 We serve our glazed salmon over our delicious coconut Jasmine rice. Jasmine rice is an exotic long-grain rice, with a naturally buttery-sweet flavor. We cook our rice in coconut milk & cilantro to further bring out the rich character of the rice, and compliment the sweetness of the salmon. Our Jasmine rice, before simmering in coconut milk. 4.) Seared, glazed, and oven-finished to perfection. A good, fresh fish doesn't need a lot of fixin' to make it amazing. After a light sear, we add our simple, lightly sweet & tangy glaze, and pop the salmon steak in the oven to finish cooking. The meat is flakey & tender, and the flavors are delicate & crowd-pleasing. We have lost count of the number of times we've heard that our salmon is the best salmon they've ever had. If you haven't tried our Salmon yet, come on in & see why this dish is a best-seller here in downtown Moultrie, Ga! We open for supper at 5:00pm Tuesday-Saturday. Our telephone number is 229.985.2525, and we are located at 25 1st Street SE Moultrie, Ga. 31768. Monday, April 27th is our next Wine Night event. Wine nights have become our favorite night of each month. With four unique wines and four food pairings to compliment each selection, our kitchen gets a chance to really flex their creative and culinary muscles, while our diners get treated to an unmatched dining experience right here in Downtown Moultrie. This time around, we're tasting wines from all over Italy, and so our cuisine will be an exploration of Italy, from Alpine Northern Italy to the Mediterranean Southern Italy. 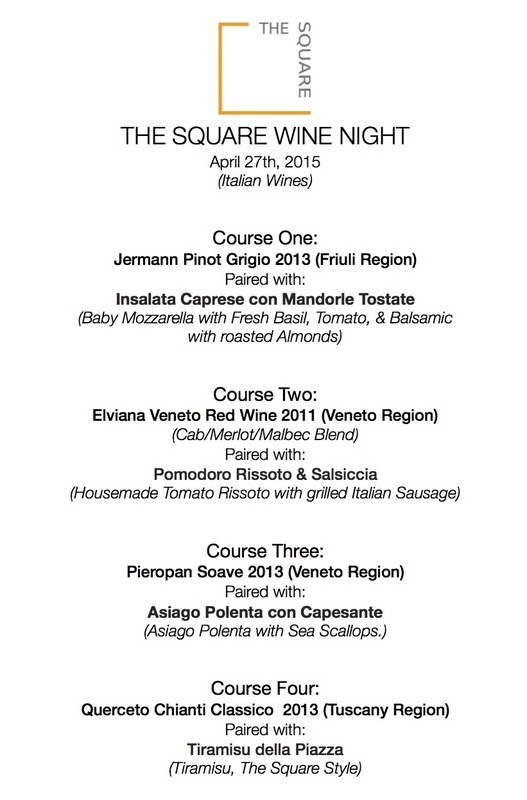 If you've ever attended one of our other Country-specific wine nights, then you know we're in for a treat this month! This month's wine night will be limited to 35 seats, and will only cost $30, including all four courses and 4 wine tastings. If you would like to take part, please respond to this email, call 229.985.2525, or just make a reservation while you are dining here! Welcome to Moultrie! If you've driven though but never really been here, you might just think that Moultrie is a Huddle House & a Walmart that you pass by on HWY 319. But turn down one of our pretty tree-lined roads, and you'll soon discover that Moultrie is a beautiful little gem of the South, filled with fantastic homes, historic places, and acres of untouched wildlife. And we have a LOT going on here in this little town! Visit our gorgeous Courthouse & Downtown Moultrie. Our gleaming white Courthouse is without a doubt the most recognizable icon in Moultrie, and beloved by all who grew up here. Built in 1902, it is still in use by the city; but visitors are welcomed to enter the building. The courthouse yard is also a favorite spot for locals and visitors alike, with ample park benches, iconic old-growth magnolia trees, a pretty fountain, and a welcoming grass lawn that welcomes visitors year-round. Surrounding the courthouse is our beautiful, bustling downtown. We have local shops and restaurants to pique any interest, including antiques, jewelry stores, clothing boutiques, gift shops, pool halls, sweets shops, bakeries, salons, and more. You can shop all day and the eat at one of our great local restaurants at night! Throughout the year, we have fun family events & festivals all around Downtown. Be sure to follow Downtown Moultrie's Facebook page to stay up on the events that are happening each month! Walk/Bike/Stroll/Run our beautiful walking trail. It's 7.2 miles of a well-mantained meandering path that runs from our airport to our pretty little downtown. As part of the “Rails to Trails” program, the linear park replaced historic railroad tracks, and provides a scenic route for bikes and walking enthusiasts of all ages. The path takes you past agricultural land, woodlands, beautiful homes, a bridge over a pretty creek, athletic facilities, and lots of shade. Year round, families, athletes, seniors, and couples enjoy the path. If you have kids, you will LOVE our new Main Street Park! This family play park has been built along the beautiful, tree-lined South Main Street, which is worth the trip in its own right. Main Street is a drive among beautiful historic homes and architectural gems. The Park has become the hub for young families, many strolling or walking to the park from their neighborhoods. The park features walking paths, playgrounds, picnic areas, a shaded pavilion, restrooms, and ample parking. You will find young families there from sun-up to sun-down every day of the week. Explore our word-class Arts Center. Moultrie has a surprisingly vibrant art community, and at the center of it is our Arts Center. The center features visual & performing arts classes, fantastic art gallery spaces, after school programs, exciting events, theatrical & musical productions, and more. The Arts Center is housed in a vintage high school, and it is a beloved, well-supported institution in our community. Catch a Packer Football Game. If it's a Friday night in the Fall, it's Packer time! Colquitt County is a town that LOVES our football team, 2014's 6A State Champions! The Pack play at Mack Tharpe Stadium, a nostalgic facility built in 1954, and it is "packed" out for nearly every home game. Our colors are Black & Gold, so dress the part if you want to fit in! RoseMott Winery at Gin Creek. You might not think of South Georgia as a wine destination, but things are changing down here! Gin Creek was the first winery to open in Colquitt County, and more are coming! Featuring historically Georgian grapes with a surprising variety of characters, a visit to Gin Creek might result in the discovery of your new favorite bottle of wine. Families, including kids, will enjoy a tour of the scenic 50 acre vineyard facility. If you are a coffee or music lover, don't miss a stop at Beans & Strings. If you've never been to a Coffee Shop / Music School / Performance Space / Local Hangout Spot, you need to make time to come visit Beans & Strings. They are a busy music school, teaching a variety of musical instruments to students of all ages, while serving up the best coffee & smoothies in town in a comfortable, welcoming space. Follow their Facebook for updates on performances and other community events. If you are an adventurous traveler, load up and explore the back roads! With 557 square miles of land, you can have a lot of fun getting lost on the back roads of Colquitt County. As a part of the old south, this county is criss-crossed with scenic canopy roads, dirt roads, rolling pasture lands, waterways, and miles-long views that will have you stopping the car to snap photos all day long. Along the way, be sure to find some of the many Geocaches hidden around the towns and in the county. Eat local! Being one of the biggest agricultural counties in the SouthEast, it would be a shame to come here and not eat REALLY well! The Square Restaurant works hard to provide a local, farm-to-table experience as often as possible, but that's just the beginning! You could spend a whole day exploring the agro-tourism of the area. We have a fantastic State Farmer's Market that has markets open to the public. Many farms offer U-Pick fields seasonally, and no Spring is complete without a trip out for some strawberry picking at Ochlocknee Ridge Farms! (Hint: like RIGHT now in April!) Some of the best, most-loved dairy products in the state are from right down the road at Sparkman's Cream Valley. They have a great little country store that's open every weekday, and it's situated right in the middle of the dairy, so there is a very good chance for a Jersey Cow sighting! We love this community, and we love bragging about this town that we jokingly call "Mayberry" to out-of-towners, who regularly fall in love! If you are new to town, or just passing through, be sure to check out some of these local gems. If you are a local and have other tips on how to spend your time here in Colquitt County, please add your ideas in the comments below! Secret Square: 6 Secret menu hacks to try tonight! Our regulars know that we are sneaky, sneaky, sneaky... and we have treasures hiding in the menu that only a few folks discover. Want to order like a regular? Here are few supper hacks that you can can order tonight! Order your burger "Miley Cyrus" style to make any burger into a low-carb option. (Psst... Miley Cyrus = No Buns! "Pimp" your cheeseboard. 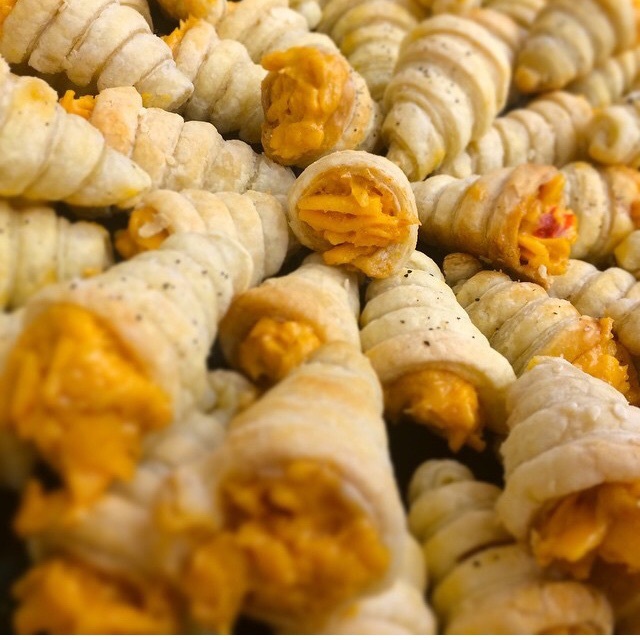 You can sub a cheese selection for a scoop of our smoky pimento cheese! Why not pair a fine French triple crème and a beautiful raw cow's milk cheese from Italy with a Southern classic? It's a delicious deviation! Freestyle your side salad. Our main entrees all come with a simple side salad, and you can take your side salad to the next level by ordering *any* of the topping options from the Build-Your-Square-Salad menu to go on your side salad! Suddenly, your side salad might take center stage! Forego the mains completely and mix-n-match the small plates to invent your own main course! Want hot fried green tomatoes topped with pimento cheese? Nobody's stopping you! Order away! Surf-N-Anything! Love our wild-caught Ga Shrimp? We do, too! You can add those sweet shrimp to anything on the menu! Anybody feel like a New York Strip with wild-caught shrimp tonight? 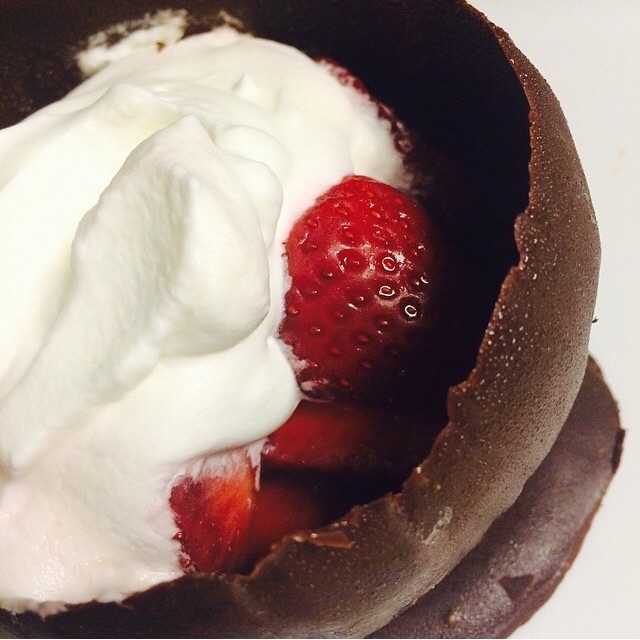 We love our regulars, and they are always finding new ways to reimagine our dishes! Come on in tonight and impress your family... order from the "secret menu!" The way we found Jessica for this new catering position is what we like to call around here a "Godwink." A church friend of hers blessed her with a date night; and she happened to choose to dine at the Square with her husband. That very day, we had been discussing the concept of implementing a catering program. A quick chat after dinner lead to what has turned out to be coworker gold! We simply could not ask for a more dedicated, hard-working, and creative team memeber than Jessica. She has brought a new facet to the restaurant, often working shoulder-to-shoulder with owner Phillip Viohl to create beautiful, exciting new dishes. She is self-taught and self-motivated to continually improve her craft. With over a decade's worth of restaurant work experience, she has truly become an asset to our café. Whether we are hosting a bridal luncheon, wedding reception, birthday party, or reunion, both our dining room and our little hidden bar/lounge area make for gracious special event spaces. We can host special events as large as 120 people, or as small as a table for two. On location, our catering options become even more exciting, as we have catered everything from office lunches to wedding receptions on location, and have a great time doing it! Because our menus are all custom, we can build almost any menu to suit our clients' needs, which is a great creative outlet for Jessica. We are experienced in creating special gluten-free, vegan, raw, dairy-free, and other unique menus for those with medical dietary concerns. You can call her directly at 229.798.3656 or email her at catering@thesquarellc.com for more info! Native beef: The surprising, local origin of our steaks. 500 years ago, while Europeans while still exploring Florida, the Seminole tribe were already raising cattle there. They can rightly be called the original American cowboys; and their understanding of beef has improved and deepened for hundreds of years now. When we started looking around for local beef for our restaurant, we were thrilled to find out that Seminole Pride are raising cattle right down the road from Moultrie in North Florida! Once we partnered up with them for our steaks, we never looked back. We have been impressed by their quality & consistency the fact that they are certified non-hormone treated cattle (NHTC) by IMI Global, a third-party auditor, and are antibiotic-free (ABF). Our New York Strip Steak are a continual favorite menu item here at The Square. We cut the strips here in house, and we have been pleased with every order. The meat is tender and beautiful, and flavorful enough that all the steaks need are a little salt & black pepper and a few minutes on our antique cast iron to be absolute perfection. When we started The Square, I said to Phil, "I want to be able to actually eat here at this restaurant, Mister!" I said that because as a vegetarian, going out to eat can be a real trial. Between menu items that hide meat, wait-staff that don't know the ingredients of food items, and "salad" as the lone vegetarian option, I often end up just having the bread, or if I am lucky, a soup du jour. So, The Square's menu is a little bit sneaky... we have several items on there for almost every dietary concern. 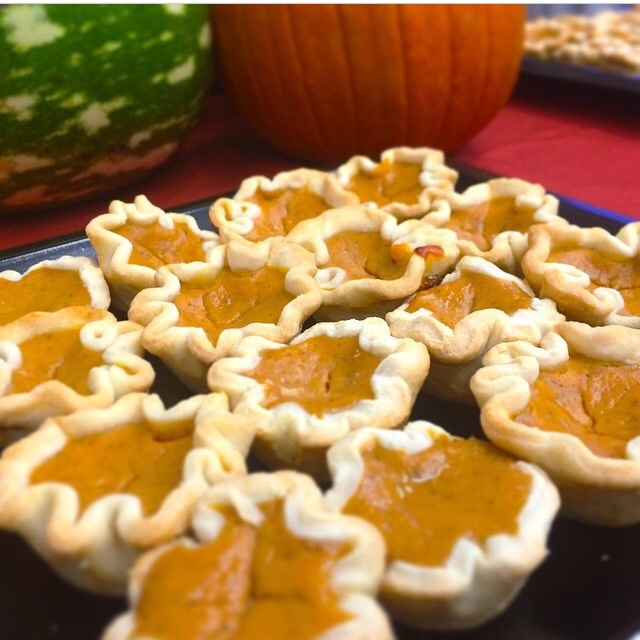 Looking for gluten-free options? We gotcha. Can't have dairy? No problem! Don't want to eat meat? You don't have to! Some of our "sneaky" vegetarian options are our boiled peanut hummus, fried green tomatoes, deviled eggs, hoppin' john, black bean-quinoa burger, roasted tomato bisque, and yes, our build-a-salad option. Our "sneaky" gluten free options include: Ahi tuna over quinoa, fresh-caught salmon, our local new york strip steak with farmhouse mashed potatoes, and even our not-yo-mama's meatloaf, which we make with oats instead of bread crumbs. Since our kitchen makes nearly everything from whole, raw ingredients, and we work from recipes that we created in-house, it is easy for our wait staff to help you select menu items that work within your unique dietary needs... no need to settle for a side salad and crackers. PS: ...Because Phillip (the mister) basically survives on rare meats and craft brews, it should be said we also have LOTS of great options for meat & gluten & dairy eaters, too! Maggie Koerner coming to The Square! We are just SO excited to welcome one of our very favorite musical artists to play here at The Square this month! Maggie Koerner is an extremely talented singer/songwriter that we discovered in 2013, when we were renovating this old building here in Downtown Moultrie, Ga.
She has a soulful, bluesy sound, with killer lyrics, and a decidedly funky N'awlins edge. We had her music on continuous play during many long hours of swinging hammers and sanding floors, so it's especially poetic that she will be here live in our restaurant on the evening of April 18th, 2015! She will be playing outdoors for an earlier show as a part of Downtown Moultrie, Ga's annual Spring Fling festival, then moving it into The Square for a more intimate acoustic set that evening. As a gift to every one here in South Georgia, there will be no entry fee for this live music concert, but the seating will be limited, so it will be a first come, first served kind of deal! Fresh, fresh, fresh! At The Square, fresh ingredients are king. Often the first thing that folks notice when they dine here at The Square is that the menu items are very clean and simple. If you ask any of the waitstaff what's in a particular dish, it's usually fewer than 5-7 ingredients in total. 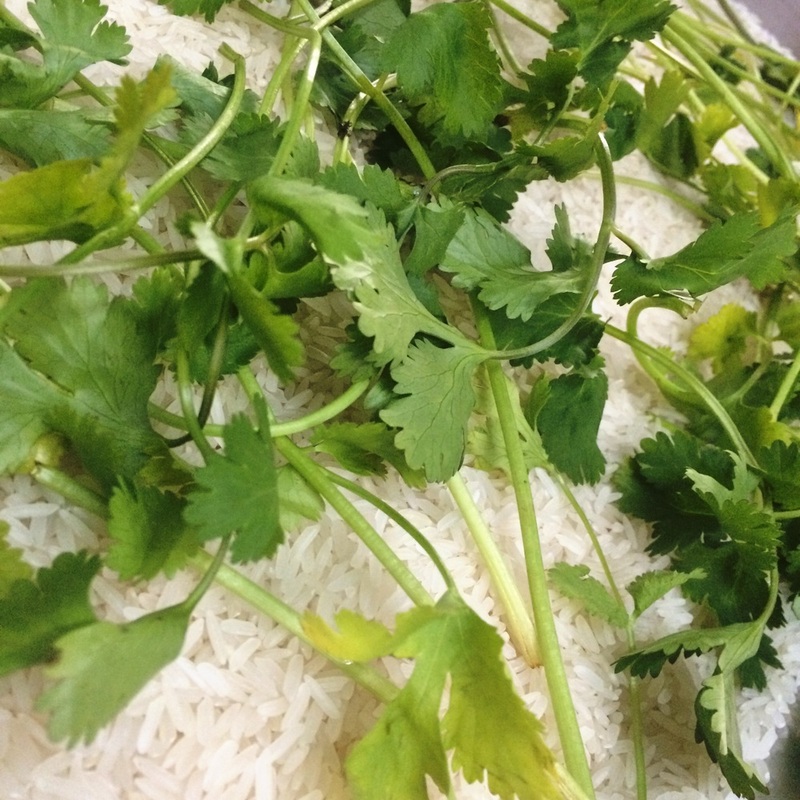 We get away with it because we start with the very freshest ingredients we can get our hands on. Whether we are working with a fresh-caught salmon, a locally raised cut of beef, or a beautiful ripe red local tomato, starting with fresh, real, whole food ingredients simply leads to better tasting food. Living and working in Moultrie, Georgia gives us ample opportunity for fresh, local offerings, as Moultrie & Colquitt County are the largest agricultural communities in the Southwest Georgia region. Relationships with local farmers and food craftspeople as well as top-notch food distributors makes finding the freshest ingredients a breeze. Owner Phillip Viohl likes to get his hands on every protein that is delivered to our kitchen, which is why we do most of our butchering in-house. You can tell the difference by the flavors that a beautiful, fresh fish & seafood can impart. People often ask what secret sauces we add to our Salmon, Tuna, and Shrimp to make them so sweet and meaty, and not fishy at all. The truth is that they are just really high-quality proteins, so most of the hard work is already done for us as soon as the fish is caught. We've got a similar philosophy for our beef and pork dishes. Our hand-cut New York Strip steaks also do not need much more than a little sea salt and black pepper to bring out the naturally juicy, tender texture & hearty flavors that come from a great cut of beef. We sear every steak in antique cast iron, which finishes the flavors and seals in all the moisture of a great cut of meat. Our pork ribeyes are similarly simply dressed, as that thick, tender cut leads to a naturally juicy, flavorful experience when they are cooked properly. Our Southern / eclectic soul food take on fine dining really finds its feet there in the beautifully prepared meats that we deliver to our diners. Getting to use fresh produce makes our prep work as beautiful and colorful as it is integral to our every day operations. Possibly one of the most popular menu items that we've ever had in this restaurant is our simple, delicious Roasted Tomato Bisque. It's a deceptively simply dish, a hearty, soul-warming tomato soup that has people ordering a bowl to eat at the table, and another bowl to-go for their lunch the next day. Folks just rave about it! But the only real secret is that every pot of tomato bisque starts its life as a 20 pound box of fresh ripe tomatoes. Once they are slow roasted throughout the day, there is not much left to do but to add a few herbs and spices! We have had similar rave reviews about our ever-popular southern staple food: Fried Green Tomatoes. Each batch starts with crisp green tomatoes and a fresh batch of handmade cornbread. The cornbread is cooled and crumbled to become the crust for the fried green tomatoes, but they wouldn't be as tangy and delicious if we weren't able to get our hands on beautiful green tomatoes. One of our most talked-about sides is the Creamed Collards that we pair with our Pork Ribeye. That recipe is actually the most complex of all our menu items, but it starts with simple field-fresh collard greens. When people taste the collards, they love the tangy, sweet complexity of that recipe, but they can never guess the secret ingredients. The addition of our build-your-own-square-salads has been a fun way to shake up our use of fruits, vegetables, nuts, cheeses, and more. We get to source what's fresh and delicious every day, which leads to a new possibility for your customizable salad every single time you dine at The Square Restaurant. We love working with & serving fresh, whole foods everyday. We hope you will enjoy dining with us soon! 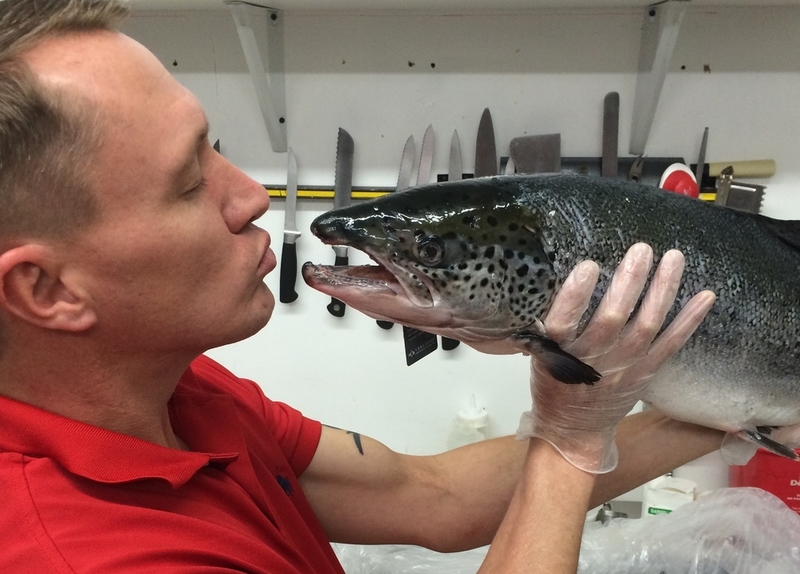 Phillip Viohl LOVES our fresh, wild caught salmon! Last week, we launched a new version of the menu, and folks seem to be loving the customizable salad option! Already, we're amazed and impressed by the creative combinations that our diners have come up with! The updated Not-Yo-Mama's meatloaf has been very popular as well. All of the changes on the menu came directly from our diners, so please keep your great feedback coming! As we approach our 18th month here in this space, we are making big & little changes to make your dining experience here even more enjoyable! The first change we are making will be to install light-reducing shades for the front windows. No more squinting if you are an early bird diner! Our hope is that the blinds will make The Square feel more cozy and comfortable for those dining when the sun is still up! Next, we'll be saying goodbye to our farm-house style table legs and replacing them with more modern table legs to give more leg-room to our taller diners. We love our antique cotton cart table tops, so we'll keep those. The look won't change much, but the comfort level will go way up for our diners who need more room. All of these changes are inspired by YOU, our diners. We appreciate your patronage and your feedback, and we hope to see you soon! Visit us online at The Square's Website.